Synopsis: Ten years ago, Calamity came. It was a burst in the sky that gave ordinary men and women extraordinary powers. The awed public started calling them Epics. But Epics are no friend of man. With incredible gifts came the desire to rule. And to rule man you must crush his wills. 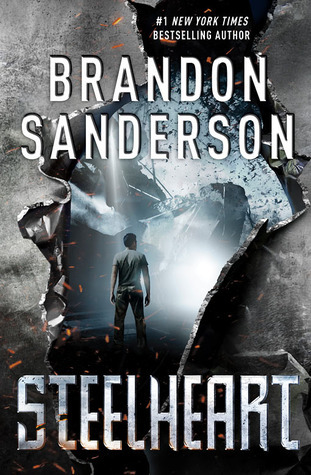 Review: This was my first Brandon Sanderson book I’ve read and I was so excited to start it! I really wanted to start out wit the Mistborn series but am happy to be reading this, nonetheless. The Writing – As stated above, this was my first novel by him so I had high expectations and I am glad that I wasn’t disappointed. Everything was so vivid and flowed so well. Even the tone of the characters was spot on. I could visualize the world and imagine what the characters looked like just based on their description. The Characters – David was a great protagonist with awful metaphors. I didn’t really like how set he was on revenge or how he was with Megan but he was a good main character. You don’t really get much back story on the others. You learn a few tidbits here and there. I believe I read in the book that they don’t share much about their personal lives because if one of them gets caught the don’t want to know too much about them which is smart in a way. I hope that as I read the sequel Firefight that we get a little more insight into the characters. The World – It’s quite interesting set up as it is like our world now but not. There is now the presence of these Epics that have turned the world into the dystopia. Epics have powers and are ruling the world by them. The Plot – Was captivating from the beginning. Is aw it going in a different direction as there was a superhero aspect being introduced but it is neat that he changed he way the superheroes are viewed. The superheroes are actually the bad guys. I loved the plot twists at the end. You kind of see them coming with the foreshadowing but there was one that shocked me! This entry was posted in book review, Brandon sanderson and tagged book review. Bookmark the permalink.